A reader asks: Were people, especially women, really literate this far into the frontier? Not everyone was literate, but more than one might suppose. The Puritans required schools for towns with more than 40 families, and schools like Dame Beaman’s abounded. They taught boys and girls up to ten years of age in basic skills, reading (mostly the Bible) and some writing. At the age of ten, girls could continue to study at home or help with the elementary school as Lizzie and her friends did. Not all children attended but many did and some excelled. A wonderful example is the captive, Mary French, who returned to New England with her father while her sisters, Freedom and Martha, remained to become members of French-Canadian society. 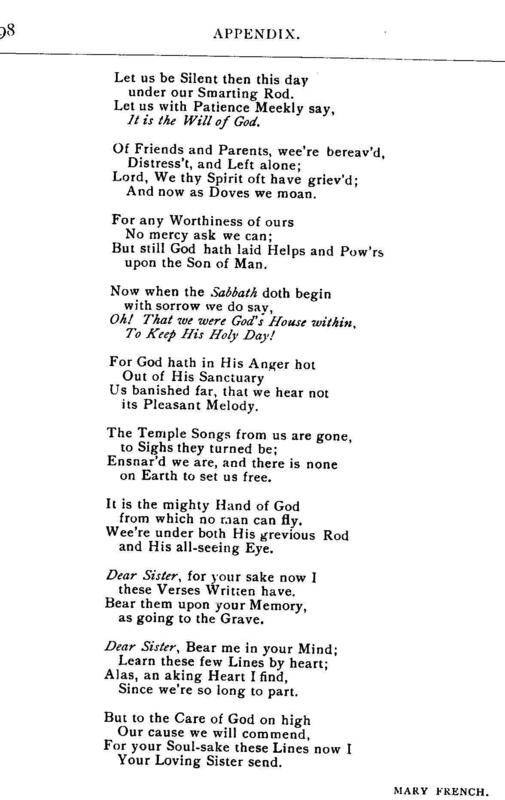 She is said to have written a poem to convince her siblings to abandon Catholic Canada and return to Puritan New England. It is a remarkable document for a young girl of 17. More Questions—Julie asked: Did Puritan towns have schools like Dame Beaman’s? Yes, Schools such as Dame Beaman’s taught boys and girls until the age of ten. Towns with 50 or more homes were required to have schools. After this the boys could continue in a school with a headmaster. Dame Beaman was a real person and her legend lives on in the literature of Deerfield. She and her husband were taken captive and eventually returned to New England. Initially she taught from her home on the North end of town but later, as reflected in the story, a new school building was built with quarters for her school as well as separate quarters for the older boys’ school. It would have been common for some older girls to assist her.